Given the rest of this site, hopefully that title is pretty evident. However, today I am talking about physical books you can use for blunt instruments. Their ability to be used as blunt instruments is neither here nor there, but there you are, another point in their favor I suppose. 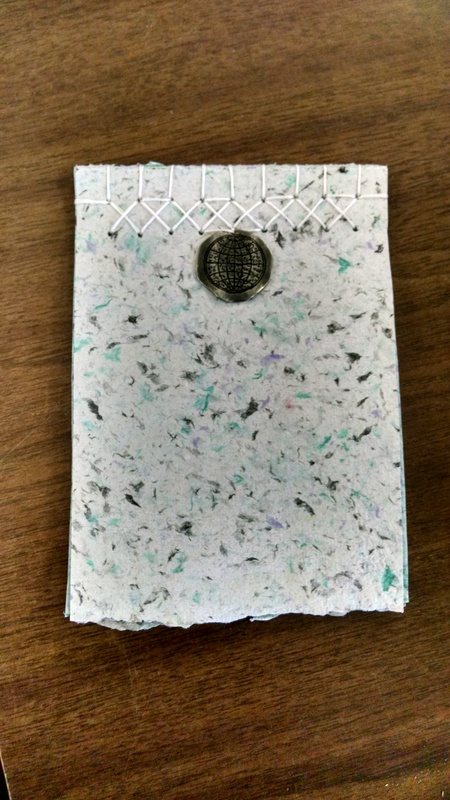 I recently had the opportunity to take a paper making class during my final semester. Let me tell you something: it is really, really difficult to make a book by hand. We went through every aspect of traditionally making a book, from the creation of the paper, the covers, and stitching the whole thing together. This whole process gave me a renewed appreciation for books as a physical product and form of art. First step: making the paper. When making paper by hand, everything gets wet. Seriously, everything. My shoes to my knees were soggy after an afternoon in the studio. It’s a surprisingly messy process for an end product that is clean and crisp. Basically, you have a mixture of pulp and water in a tub. In order to form the paper, each sheet is created one at a time on a screen and frame not unlike a window screen. The screen is dipped into the pulp and water then drawn back out. While taking the screen out, you basically feel like you are panning for gold. During our class we often used abaca— a species of banana native to the Philippines—for the pulp. Abaca creates a naturally creamy colored pulp that is easily dyed to a variety of colors. What is left when the water drains from the screen is a thin layer of pulp. Flipping the screen over, you press the pulp onto a felt. From here, you continue to make paper and stack it onto felts until you have a massive pulp and felt sandwich. Then, you place this sandwich into a press. Twenty thousand pounds of pressure later, most of the water has been squeezed out of the paper. Next, you pull the slightly damp sheets of paper and place them between blotters with a weight on top to allow them to dry completely flat, or you can let them air dry for a more crinkly effect. Once you’ve built up a sufficient amount of paper you can make yourself a book. Although we learned several methods of sewing your book together, my personal favorite is the Japanese stab binding technique, which highlights the sewing, rather than hiding it underneath the cover. In this method, you stab a line (or several lines) of holes through all your sheets of paper, including thicker pieces for each cover. Then you sew a pattern through these holes, looping around the side of your book to ensure all the pieces stay together. The sewing on a stab bound book can take a multitude of patterns. After tying off the thread, your book is ready to flip.